The VHD data recovery tool is capable enough to fix all possible errors when using aWindows Hyper-V virtual machine. It also helps to regain VHD data in a healthy form. Moreover, it recovers lost or permanently deleted data without any risk. It can remove any type of corruption from healthy .vhd files. The hyper-v vhd recovery software is designed to incorporate an internal search feature. 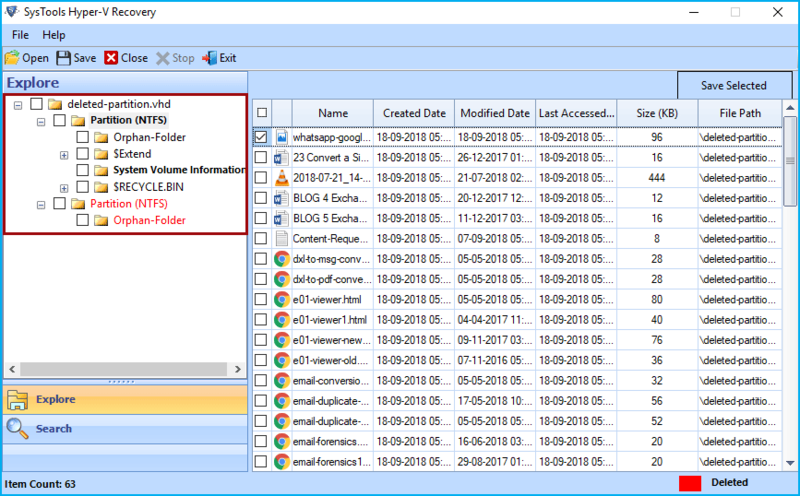 With this feature, it will be possible to find out the specific item available in the .vhd file. Users just need to enter the name of a file or file extension and software will have a list of all items present in it that match the specified search. This vhd file recovery tool permits the user to get back all formatted VHD partition data. It can retrieve all audio, video, photos, archive, etc., stored in .vhd files. The recovered items are saved in dynamic or static VHD file. The VHD recovery will support both NTFS (4,5,8) and FAT (16, 32) .vhd partitions. The software is capable to recover data from any type vhd file. 3. Raw Scan mode: The raw scan only runs when .vhd files are fixed. It also helps to search existing file for finding the lost or disappeared partition. After the scanning, users can preview the recovered VHD data. The hyper-v recovery software can display all items which are stored in .vhd file partition. It can even preview only selective files such as emails, documents, images, text files and so on. Also, it generates scanning report of partition for future reference that will help to minimize time consumption. 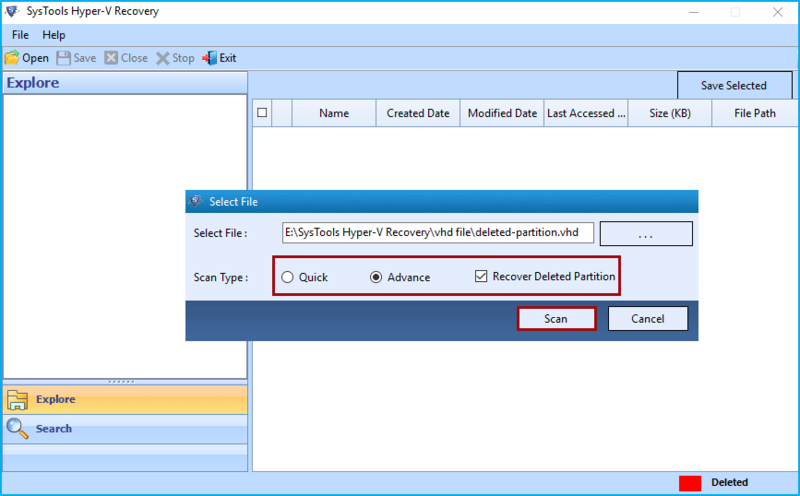 Using Hyper-V VHD recovery tool, users can easily recover data from a Virtual Hard drive. It is also considered as a part of system virtualization with Windows OS. It is also programmed with advanced algorithms to make successful and easy recovery of permanently deleted VHD file data. Does the VHD Data Recovery software work on Windows 10 machine? Yes, the software is compatible with all editions of Windows OS including 10 and its below version. It can also work with Windows 10 environment as well. Is there any size limitation of VHD file that can be recovered using VHD Data Recovery? No, The hyper v recovery software does not posses any size limitation so users can scan and restore any size of .vhd data file. Will the software save restored .vhd file with maintaining folder structure? Yes, The vhd file recovvery tool maintains orignal folder hierarchy and meta property are retained during extraction. 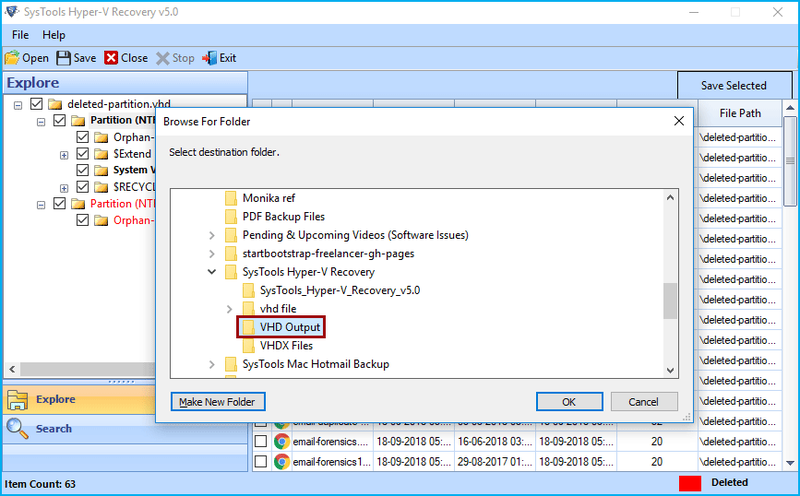 With VHD Recovery tool, Can I repair Virtual hard disk files in bulk mode? No, The software allows to add a single VHD file at once. Along with this, users can restore multiple .vhd files in batch. Does the software support the static VHD files for recovery? 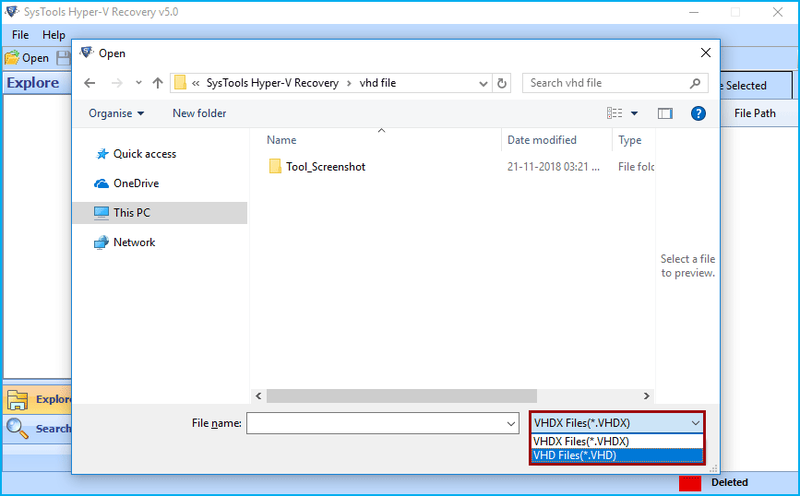 Yes, the VHD file repair tool can support dynamic as well as static .vhd file. Even it can repair VHD file from both FAT and NTFS partition. First of all, download and install the VHD Recovery Software on the local system. Then, launch the application and the home page will appear like this, simply hit on Open. Here select one Option either VHD or VHDX and select the files of selected file type. Deleted Partition Recovery: The VHD recovery software provides anvance feature to recover deleted partition from .vhd file easily. Check the checkbox f you want to recover deleted partition from VHDX file. After selecting required options hit on Scan button. 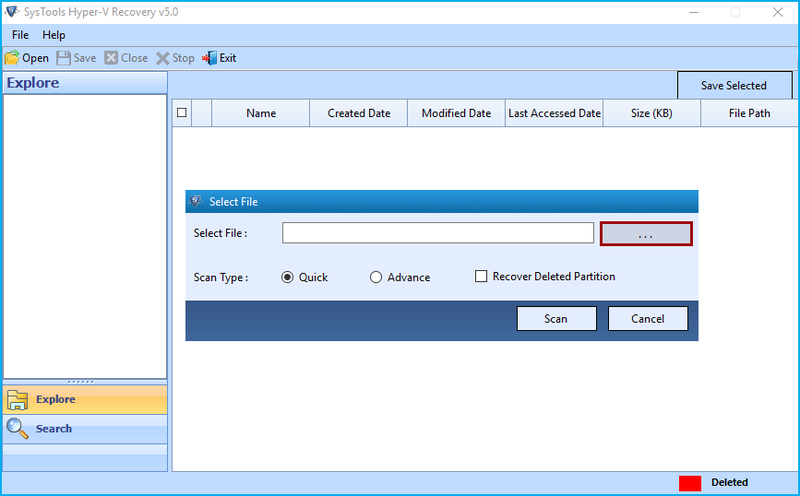 The VHD data recovery software will list all recovered files and folder into the software preview panel. Simply view all recovered files. 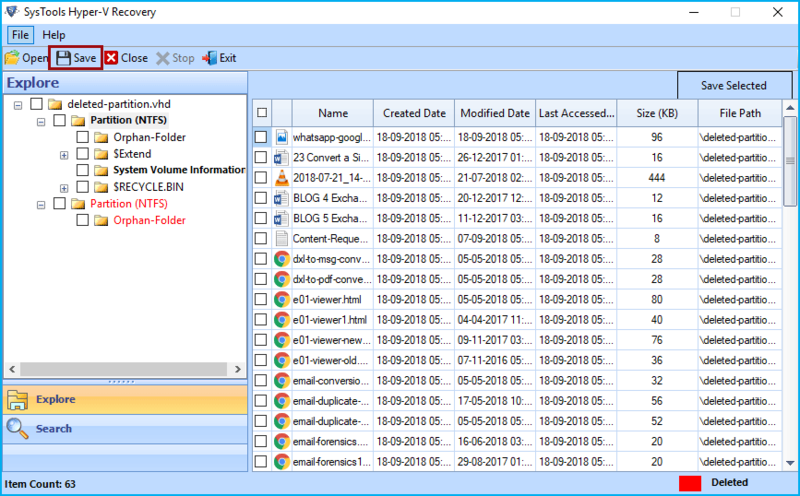 After Successful recovery, the VHD data recovery software will enable you to browse the location to saved recoverd data. 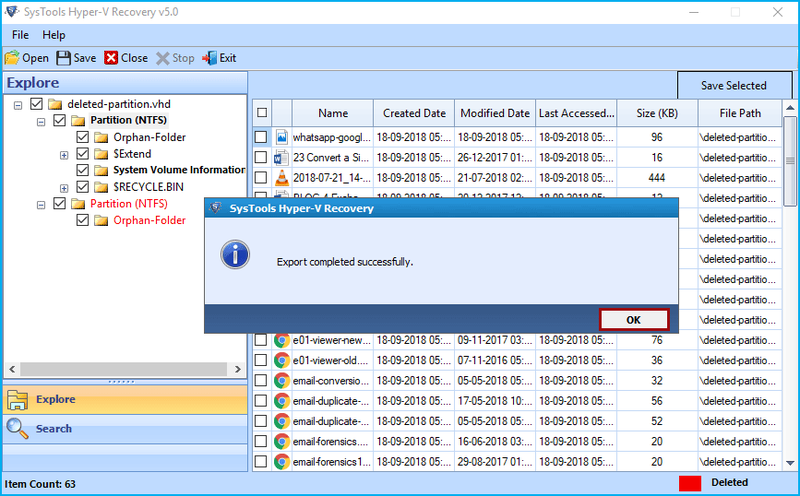 Hare the Hyper-v Recovery Software will show you export process details. 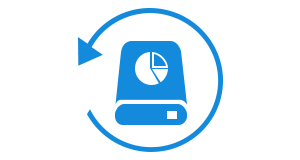 Wait till it completes to 100%. 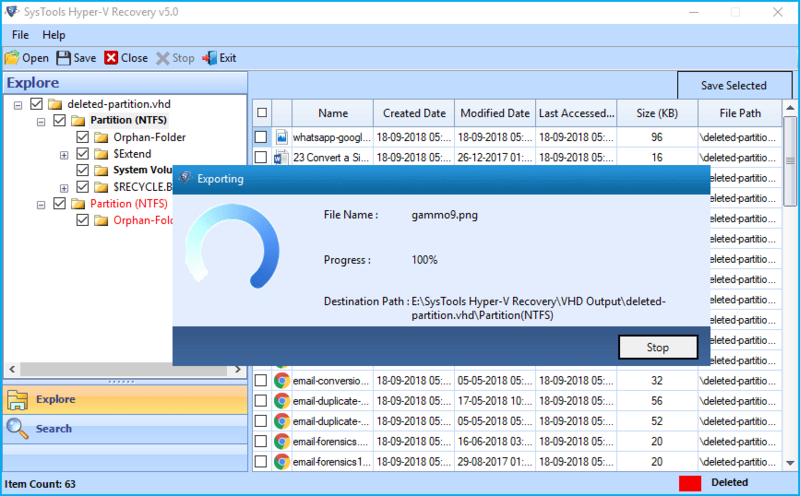 After completing export process vhd recovery tool will show you a confermation message. Simply hit on OK button to complete the process. "I am looking for a solution that can bring back the data from VHD file without any data loss. Luckily, I found an amazing VHD Data Recovery tool that helps to recover corrupt .vhd files safely. Even without the availability of Virtual Environment I can perform recovery of VHD file easily. I am impressed with the working of this wonderful product. Thank you so much!" "Hyper v VHD recovery tool is the only one solution among all, which provides the bundle of advanced features within it. The best part about this product is that it does not require any prior knowledge to perform the recovery task. I really want to appreciate the hard work of development team for initiating such a brilliant software."